When last we met on this website, I pontificated (er, shared) about approaching the holiday season with intention, using the church’s liturgical calendar for reference. Now that Advent has begun, how’s it going? Have you found the candles for your Advent wreath yet? Are all your days merry and bright? Well, be of good cheer and be not afraid: There are still plenty of ways to make this season count. Saturday, Dec. 8, is the Solemnity of the Immaculate Conception of the Blessed Virgin Mary, and it’s a holy day of opportunity (aka obligation) for all Catholics. That means one thing: Go to Mass! Bonus: Make a pilgrimage and attend Mass at our cathedral in Northwest Portland, named for the Immaculate Conception herself! If you’d like to do more to commemorate Mary, conceived without sin, you could: pray the Joyful Mysteries of the Rosary; print out coloring pages of Archangel Gabriel encountering Mary at the Annunciation for your young ones (and the young at heart); sing Marian hymns to honor Our Lady; have an older child or adult proclaim the Annunciation Gospel (Luke 1:29-38) from your family Bible; plan an “all white” dinner menu; or bake a white cake to celebrate. One family I know decorates enough cupcakes to represent each bead of a five-decade rosary in honor of Our Lady! How’s that for a Pinterest-worthy project? Sunday, Dec. 9: The Second Sunday of Advent. Remember your Sunday obligation and attend Mass together as a family. We light two purple candles on our Advent wreath. If you haven’t yet checked out the Festival of Lights at the Grotto in Portland, I highly recommend it! Alternatively, take a drive or a stroll around the neighborhood and see which light displays put an extra twinkle in your eye. Wednesday, Dec. 12: The Feast of Our Lady of Guadalupe, who appeared to St. Juan Diego on a Mexican hillside in 1531. Check your church bulletin to see if your parish is one of many in our archdiocese celebrating the feast with special Mass, music, food, and other family-friendly festivities. Sunday, Dec. 16: The Third Sunday of Advent, also known as Gaudete (“joy”) Sunday since Christmas is quickly approaching. Attend Mass together as a family. After Mass, smile at your priest and ask him if his vestments are pink or rose colored. 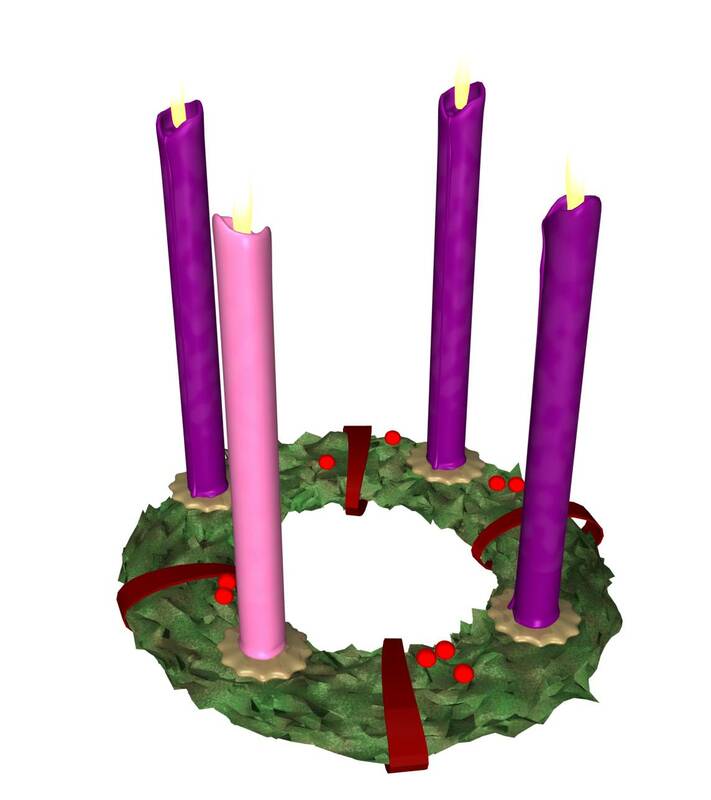 We light two purple candles and the pink candle on our Advent wreath. At mealtime, take turns sharing those things that fill your heart with joy. Sunday, Dec. 23: Sweet fancy Moses – it’s already the Fourth Sunday of Advent! Today is another opportunity for Mass as a family. We light all four candles on our Advent wreath. Jesus will be born (super-duper) soon! Monday, Dec. 24: Celebrate the Nativity of Jesus Christ at the Vigil Mass or Mass During the Night (aka midnight Mass). If your family naps or stays up and braves the literal midnight Mass at your parish, I salute you! Someday, I tell myself – someday I will attend midnight Mass at Christmas again! For now, our regular family tradition, when we’re not traveling to visit relatives, is to attend the Christmas Eve “family” Mass at our parish. This Mass features a pageant starring Mary, Joseph, (a real baby!) Jesus, and shepherds/angels/sheep who look suspiciously like children I see at church on other Sundays. After Mass, we feast on my Lola’s chicken adobo recipe with rice for dinner and enjoy a special birthday cake for dessert (and, yes, we sing “Happy Birthday” to Jesus). Then the kids open one gift before we all settle in for a long winter’s nap (aka family movie time). I’m campaigning for “It’s A Wonderful Life” this year; wish me luck! Tuesday, Dec. 25: Christmas Day. Glory to God in the highest and peace to people of good will! Jesus is born! Emmanuel! God is with us! If you didn’t make it to church on Christmas Eve, or even if you did – what better way to celebrate the Nativity of the Lord Jesus than by attending Mass at Dawn or Mass During the Day. In the morning, our family opens small gifts in stockings, pauses for breakfast, and then opens and admires gifts. The rest of the day is usually spent wrangling kid-proof packaging, hunting down batteries, and searching for sanity. I’m kidding. Mostly. Above all, this Advent season, let’s remember that this time of year isn’t about who can decorate the most sugar cookies, string the most lights on the tree, buy the most gifts, or hang the most ornaments. It’s about filling in the valleys, lowering the hills, and straightening the highways in our hearts to receive our Lord and Savior, Jesus Christ. May it be so for you and yours this Christmastide. Amen. Renshaw is a wife and mother who lives in the wilds of suburban Portland. Her first book, “Death by Minivan,” is out now from Our Sunday Visitor.